The Steinhauser’s 2019 Spring Chick Dates are starting to roll in. 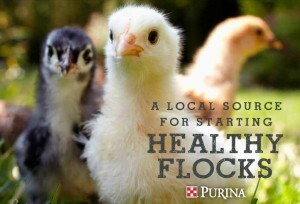 Check below to see if your store has a schedule for new baby chicks this spring. Click the store name and see what types of chicks arrive and when. Remember that chick schedules can change! The hatchery can make substitutions at any time, and deliveries can be postponed. Before packing up the car with the kids, always give us a call first to verify and confirm chicks are available. Stock up on your chick supplies. We have a variety of starter feeds, waterers, feeders, heat bulbs and much more. This entry was posted on Friday, January 25th, 2019 at 5:46 pm	and is filed under Chicks, News & Updates. You can follow any responses to this entry through the RSS 2.0 feed. Both comments and pings are currently closed.